When Patrick Molloy, a blind student at Muhlenberg College in Allentown, Pennsylvania, begins any given day, there are a few key pieces of technology that he knows he’ll use so he can perform at the same level as his sighted peers. With technology’s assistance, he’s essentially able to do everything sighted students can, but that doesn’t mean challenges don’t arise. This “leveling of the playing field” is a relatively new phenomenon, as assistive technology for people with disabilities has only recently made such huge advances. 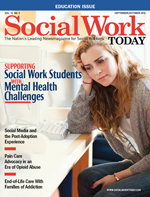 The result has some fascinating implications for society and the field of social work. John C. Bricout, PhD, a professor and the associate dean for research and community outreach in the University of Texas at Arlington School of Social Work, has been studying the use of technology among people with disabilities. He says technology may not only enhance the abilities of these people but may make them even more capable than what’s considered “normal” in today’s society for nondisabled individuals. Bricout uses the example of Oscar Pistorius, a double amputee sprinter who had initially been denied a shot at the Olympics for being too fast. His carbon-fiber prosthetic feet were thought to give him too much of an advantage over competitors. That decision was ultimately overturned, but it suggests an interesting future where people with disabilities not only have enhanced performance with technology but may actually exceed the abilities of what’s considered normal human performance. Adaptations for which social workers can offer assistance may range from the complex, such as helping to obtain a specific piece of software needed for a Braille machine, to the simple, such as helping a user “not look like a dork” when wearing a piece of equipment to aid him or her, Bricout says. “Remember that the psychosocial environment is just as important to the person’s integration into society,” he adds. Molloy says that while technology has helped him advance, it won’t necessarily “solve all problems, as many problems are very unique.” For example, he utilizes a program that reads what’s on his computer screen. It allows him to read back a paper he wrote or browse the Web. But it also poses some problems. — Lindsey Getz is a Royersford, PA-based freelance writer and frequent contributor to Social Work Today.